Are headaches in early pregnancy a sign of miscarriage? I was just reading this news on the Daily Mail regarding headaches during pregnancy. The article says that though headaches are common during pregnancy, a small percentage are caused by life-threatening neurological conditions that include blood clots and a pressure build-up within the skull. While there is no need to feel overtly panicky about headaches, women should be aware that if they suffer from continuous headaches during pregnancy or migraines that are very different their normal type, they should discuss it with their doctor. After reading that bit of news, I was reminded of my own devastating miscarriage some two years ago. My pregnancy was progressing fine and except for a bit of spotting in the 6th week which stopped within 3-4 days, everything seemed smooth sailing. I didn't experience the usual symptoms of vomiting, nausea, increased urination or sore breasts in the initial weeks. Beginning from the 8th week or so, I would get a bad taste in the mouth, began to have a dislike for certain foods and had an heightened sense of smell along with sore breasts. The 10 week ultrasound scan showed the baby growing normally. So far, so good. In the twelfth week, I started getting headaches. The headaches persisted for 3-4 days; I even called the doctor who just brushed it off as a normal pregnancy symptom and asked me to apply pain balm or take a paracetamol like crocin if it was worse. However, I didn't take any medication and the headaches stopped on their own. I really can't blame the doctor for this as according to the American Pregnancy website, headaches during the first trimester is believed to be caused by the surge of hormones along with an increase in the blood volume circulating throughout your body. These headaches may be further aggravated by stress, poor posture or changes in your vision. At 13 weeks I was called for another medical checkup. My meds were changed as it was the beginning of my 2nd trimester and the doctor said that everything was fine. After that, again I started getting headaches; I had never experienced such persistent headaches for days together in my life. I should have called the doctor but it didn't occur to me. I would also get terrible nightmares some nights and I was getting a feeling that all was not well. Something seemed amiss somewhere. My pregnancy symptoms seemed to disappear and I thought it was normal because anyway most women report that their symptoms disappear after the first trimester. But even then I had an uneasy feeling. After the 17th week, I was supposed to have another complete obstetric scan. I just hoped that everything would be alright. But 4 days before the scheduled scan, I started bleeding without any cramps. The ultrasound revealed that the fetus had no heartbeat and had stopped growing at 15 weeks. And thus I lost my baby. 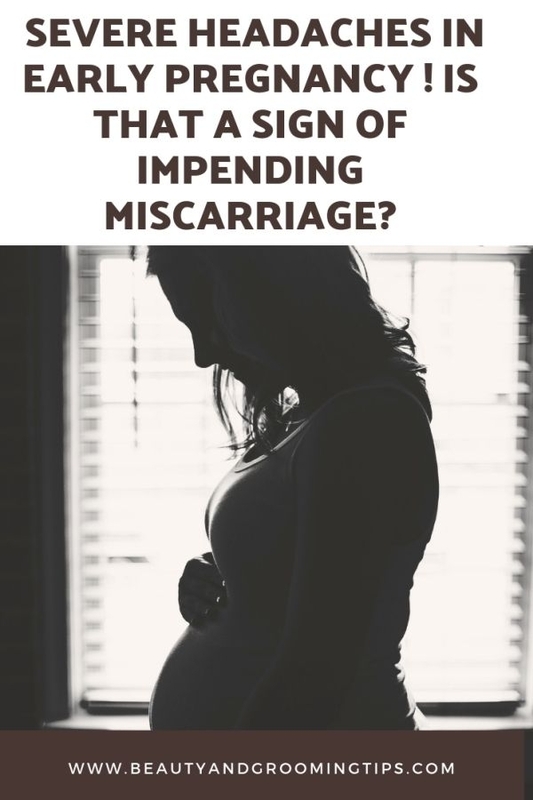 After this devastating miscarriage, I didn't get such terrible headaches ever again but I went through a phase of depression that lasted for several months. Now my question is - are terrible headaches during the first trimester of pregnancy an indication that everything's not right with the pregnancy? What about recurring nightmares accompanied by an uneasy feeling? Do they also foretell that the pregnancy is not viable? At least in my case it was so! Did any of you suffer from migraines / headaches or had nightmares before a missed abortion or miscarriage? What causes the fetal growth to stop abruptly? Is it low progesterone? Is it due to chromosomal abnormalities? Or is it because the conditions in the uterus is not favorable for fetal growth? Do share your experiences and thoughts in the comments. Going cold turkey on caffeine can also make your head pound. A lot of women experience headaches due to dehydration - especially in early pregnancy with the increased blood flow for the baby. Try to increase your fluid in-take . . . it might help and it won't hurt! Drink more water you maybe getting dehydrated that what happened with me. I felt better after drinking more water . Both my sister and I both suffered headaches a week or so before having missed miscarriages. In my sisters case, she had two miscarriages and realised she was miscarrying the second time due to the re occurrence of the headaches. I believe that there is a connection. Sorry for your loss. Missed miscarraiges are devastating experiences. I'm sorry to know about your sister's and your loss. I am just having a missed miscarriage and I started to get really bad headaches about two weeks ago. I assumed they were to do with the pregnancy but now feel that it was probably linked to the miscarriage. Anonymous, sorry to know about your loss. I can feel your pain; I've been there. I too thought that headaches were a normal part of pregnancy but obviously very bad headaches signify something else. My first pregnancy everything was fine... 7/8 week ultrasound was fine and we saw the heartbeat. A week later I had extreme fatigue/discomfort one day, to the point where I couldn't get out of bed, I'm not totally sure if headache was involved. After that I felt great (no more pregnancy symptoms). The next week I had the 9/10 week ultrasound and there was no heartbeat/baby had stopped growing. I think he died the day I felt sick. 2 weeks ago I had an IUI, two days ago I got extremely sick with an intense headache, my head hurt so bad that I threw up. Yesterday I had my first hcg bloodwork and it came back positive but my dr says the numbers are so low that it is almost definitely not a viable pregnancy. So yes, I am convinced that both times I had an extremely sick day, I lost my pregnancies. I am having severe headaches at Six weeks, and having cramps and bleeding too. My Dr told me after an ultrasound that i have a threatened abortion and placed me on ugestran progesteron and redo the ultrasound in three weeks. Now i am feeling a bad headache and bled à little yday and also having cramps and contractions. Can someone please explain what is happening to me ? Things will probably be clear after your ultrasound. Take care.